Much has been written about adoption search and reunion, but less is known or written about the post-reunion experience. For adoptees, birth parents, adoptive parents, and everyone involved, questions remain: What happens after the initial reunion? Where do we go from here? What can we expect from ourselves and one another? What do we have in common? How do we create a shared history? Do relationships grow or even survive? In his first book, Finding Dolores: An Adoptee's Mid-Life Search for the beginning, the author relates the riveting and heartwarming story of his tireless two-year search for his family of origin. Though he learned that his birth mother was deceased and that his birth father wanted nothing to do with him, he also discovered that he had seven siblings who never knew he existed, but who embraced him as their brother. Following their extraordinary first reunion, they set out together on a new journey with an uncharted course, no rules for the process, no formulas for successful outcomes, and no guarantees that everyone would live happily ever after. 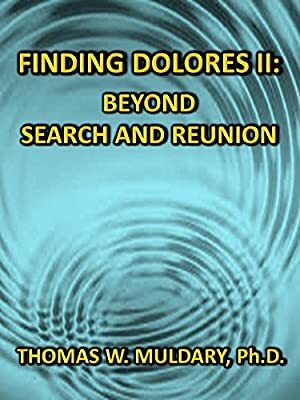 Finding Dolores II: Beyond Search and Reunion tells the rest of the story and explores issues and complex psychological and interpersonal factors that are intrinsic to the post-reunion experience, and which inevitably come into play. As a psychologist, the author provides cogent observations and insights into a post-reunion journey that led through crises and tragedy, family strife and family secrets, and the inherent challenges of becoming a family. Whether or not the relationships survived, it was certain that no one would be unchanged. Log In to track Thomas Muldary on eReaderIQ. to be notified each time the price drops on any book by Thomas Muldary. to stop tracking Thomas Muldary. We started tracking this book on May 24, 2014. The price of this book has changed 35 times in the past 1,795 days. The highest price to date was $8.99 last reached on January 18, 2015. This book has been $8.99 3 times since we started tracking it.